Wedding season is upon us here in the US and if you like me you love to dress up! I had someone ask that I create a list of sustainable brands to shop for wedding dresses so I did! Whether you are a bride to be, bridesmaid, or your just going to a wedding (or crashing it) I’ve got ya covered when it comes to sustainable dresses! Reformation is known for its dead-stock fabrics, factory transparency, and a full list of sustainability practices like reducing the water they use to produce their garments. One reason to love Christy is that she only uses dead-stock fabrics from major fashion brands! This prevents a ton of fabric from entering the landfill. Plus they pay their seamstresses a premium wage with heath benefits. Her dresses are meant to be worn and cherished for a long time, no fast fashion here. She offers petite sizing as well. Think more flowy (apparently this isn’t a word?) boho vibe with florals, lace, and all the poofy sleeves you could ever dream of! I think if I where to get married again today I would get one of their dresses for sure. And I will definitely be getting one for my 30th birthday next year. I’m going crazy for my 30th Birthday! Elizabeth nails amazing silk and linen basics that are all designed and sewn in Nashville, TN. She has an eye for designing clothing that can flatter all sizes and shapes and offers petite to plus sizes. For that workhorse LBD that you know you will wear over and over I highly recommend The Georgia dress. You can dress it up or down for any occasion and know you will look amazing! 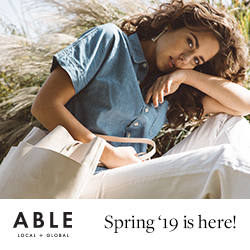 One of the first clothing companies to really promote the Fair Trade clothing movement and is truly setting an example when it comes to sustainable fashion. If you are looking for simple shapes and colors this is your spot! Designed in France with soft feminine fabrics that never go out of style. They do create small batches each season so I do recommend buying your size when it comes out to avoid missing out! All dresses are under $100 and perfect for a casual – semi formal wedding. Dress it up with a heel and a fancy hairdo and you are wedding ready. Mata Traders are all Fair Trade sourced and offer a large variety of fun prints and colors. Be sure to check out their jewelry too! They have an amazing collection! Perhaps you need a really fancy dress and you can’t shell out $1,000 for the governors daughters wedding (if this is you can I be your plus one?) Rent the runway if a great option to rent a designer/high end dress and just send it back after the event. Think of it as a library of beautiful clothing.